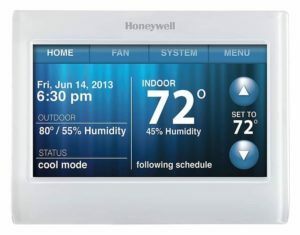 Honeywell Programmable Thermostats & More: Which to Choose? Luckily for Lucas, we love programmable thermostats at HVAC.com, so we can definitely help. A programmable thermostat is a thermostat designed to automatically adjust the temperature in your home based on programmed settings. Programmable thermostats allow you to set a schedule for your units, delivering heating and cooling only when you need it and saving you hundreds of dollars over the life of your system. At its most basic, a programmable thermostat lets you set an operating schedule for your HVAC system, avoiding wasted energy on heating or cooling your home when you aren’t there. When you choose a programmable thermostat, the most important thing to consider is the kind of schedule you keep. How often are you away from home? Are you gone at the same time everyday, or does your schedule change? Programmable thermostats come three different models — 7-day, 5+2 day, or 5-1-1 day — that reflect the different types of schedules each programmable thermostat will allow for. Consider the type of schedule you and your family keep and how much scheduling flexibility you need before choosing the right programmable thermostat for your home. 7-day models let you set different heating and cooling programs for each day of the week. They provide the most scheduling flexibility and are great for homeowners with busy schedules. 5+2 day programmable thermostats allow you to set one daily schedule for weekdays and another schedule for the weekends. These programmable thermostats are best for homeowners with predictable, steady weekday and weekend schedules. 5-1-1 day programmable thermostats are similar to 5+2 day thermostats, with the exception of weekend scheduling. With a 5-1-1 day programmable thermostat, you set your weekday schedule and then set separate schedules for Saturday and Sunday. Vacation/hold features allow you to set your thermostat for maximum energy savings while you’re out and revert to your original schedule as soon as you return without re-programming…it’s all at the touch of a button. Wi-Fi-enabled programmable thermostats allow you to adjust the temperature of your home from a computer or mobile device. Some, like the Honeywell Lyric, use Wi-Fi and your mobile phone’s location to start warming or cooling your home when you are seven to 10 miles away. This way, when you step through the door, your home is already at the temperature you desire. System alert capabilities help programmable thermostats communicate important system information to homeowners. It will alert you when something is wrong with your system or when you need to check your HVAC unit’s air filter, taking the guesswork out of basic home HVAC maintenance. Adaptive recovery starts your heating and cooling system early to make sure your home is the right temperature when you schedule it to be. That way, if your schedule is set for 74 degrees at 5 p.m., it’ll be 74 degrees at 5 p.m. You won’t have to wait until 5:45 for your home to adjust. But be careful, adaptive recovery isn’t always the most energy efficient feature. Auto-changeover automatically switches your system from heating to cooling when the weather changes. Programmable thermostats with auto-changeover are especially helpful in climates with high daytime temperatures and cold (even freezing) nights. Full memory save will ensure that the schedules you program into your programmable thermostat remain intact in case of a power outage. The Honeywell Lyric thermostat is a sleek, mobile-app controlled, high tech programmable thermostat that boasts big energy savings. 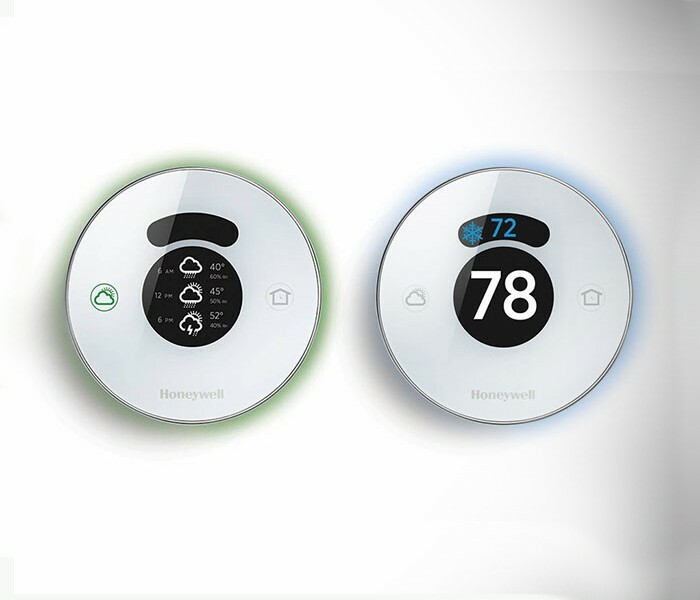 The Honeywell Lyric thermostat uses your cell phone’s location to determine how close you are to your home. When you are roughly 7-10 miles away, the Lyric will start warming/cooling your home so that the minute you step through the door, your home is the temperature you want. Additionally, the Fine Tune feature considers the humidity and outdoor temperature to ensure the temperature in your home feels like the temperature you want, no matter how humid or dry it is. This type of Honeywell Thermostat also helps you manage your home energy system’s efficiency using shortcuts and what it calls Smart Cues. Instead of trying to remember what that perfect dinner party temperature is or how warm your parents like it when they stay over, set up shortcuts labeled for key events. Smart Cues allow you to monitor your system via an alert system on your smartphone. The Honeywell Lyric thermostat will send you alerts when you need to change your air filters, when there is an extreme change in temperature or when your system is acting out of character. The Honeywell TH9320WFV6007 thermostat is a voice-activated, mobile-app controlled programmable thermostat that allows users to customize and enhance their HVAC system’s efficiency. Like the Lyric, this Honeywell thermostat includes an alert system that lets homeowners know when to change filters and when their systems are acting up. This voice-activated thermostat allows you to change the temperature in your home simply by talking to your thermostat. It uses Far-Field technology to understand your voice commands from across the room, making temperature control simple. If you are not close enough to the thermostat for it to understand your voice commands, Honeywell’s Total Connect Comfort mobile application allows you to adjust your home’s climate via your cell phone or tablet. 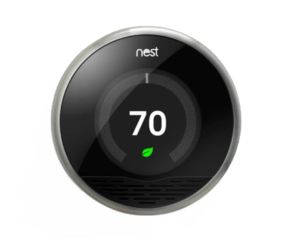 The Nest programmable thermostat system will help your HVAC system run more efficiently. Using Wi-Fi technology, mobile app control and a host of energy saving features, this programmable thermostat will save you money and increase your system’s health right away. Additionally, the Nest saves you money by automatically adjusting to being placed in direct sunlight (Sunblock), lets you know what temperatures will save you money based on several outdoor/indoor factors (The Leaf), and automatically runs the AC less when the humidity in your home is lower than normal (Airwave). These are only some of the ways Nest can help you. 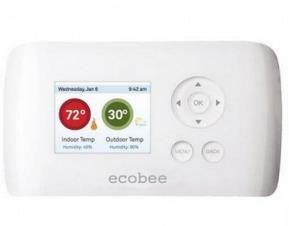 The Ecobee Smart Si thermostat is an intuitive, cost-saving high tech thermostat. Ecobee’s Wi-Fi-enabled thermostat allows you to link to the Ecobee mobile app and monitor your home’s energy use from your cell phone, tablet or computer. This allows homeowners to save up to 23 percent in home energy costs. Using Wi-Fi, the Smart Si intuitively knows when your system should be running and when it should be off. It also uses your home’s particular energy profile and reads outdoor temperature cues to determine the most efficient ways to heat/cool your home. 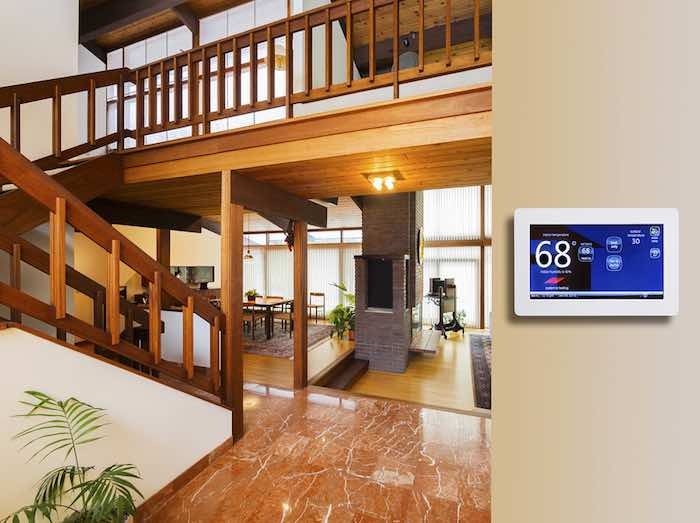 High tech programmable thermostats can be a big money saver for the typical homeowner. 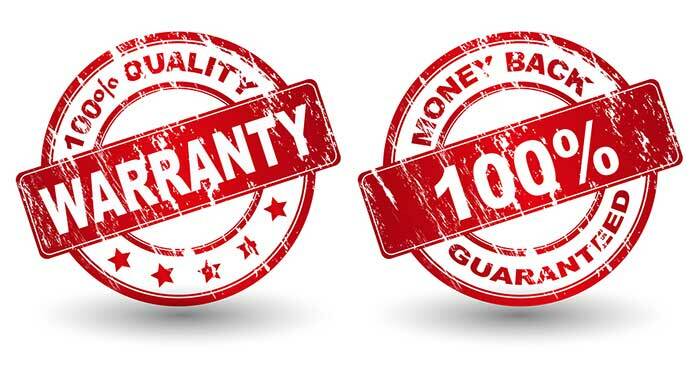 In order to determine the best system for your home, review your home’s HVAC needs, as well as how you would like to interact with your system. Use the guide above to start your research and feel free to contact the specialists at HVAC.com if you need any advice. Unsure about any of the features mentioned above? Have questions about different programmable thermostats? Let us know how we can help you in the comments below.